Hyper Light Drifter is a neon-tinted, top-down action game currently available on PC and coming to PS4 and Xbox One later this year. And despite its retro, pixelated art style, it is not a SNES game with one of the most beautiful cartridges you've ever seen. But thanks to gaming memorabilia company iam8bit, it can be. Kind of. 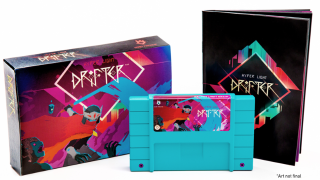 A Hyper Light Drifter Collector's Edition has just been revealed, and will be available for pre-order tomorrow, May 26. While the game itself will come to your platform of choice via a digital code, you'll also get a fake SNES-style cartridge, 24-page instruction manual, a world map poster, and a lovely box to store it all in. It's a little weird to get excited about things that used to be standard (ah, instruction manuals, how I miss thumbing through to the "notes" section that no one ever used), but even if it weren't so utterly retro, it's still worth appreciating how beautiful every piece is. Mmm. That's some garish goodness right there.